Cookies & Candies: What fits in a Chanel WOC? 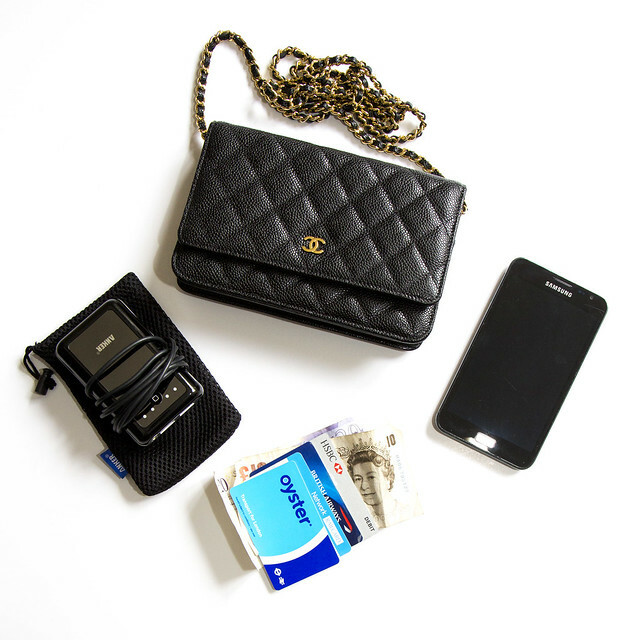 A lovely reader wants to know what fits inside a Chanel Wallet on Chain (WOC). Erm....not much if you have a mega-sized phone like mine. If I'm out and about all day, I always bring along the battery charger which unfortunately is rather bulky. There's the usual stuff that I tend to bring - the Oyster card, Network Railcard, debit and credit cards as well as some cash. Ooops. Totally forgot to photograph my keys but just visualize it in the collage. There's a side pocket on the flip side of the flap which has a very deep pocket. When I'm traveling, I tend to stuff a few notes and a back-up bank card just in case I have the misfortune of being nicked by a pickpocket. You can slip two passports down the same pocket with ease. On the other hand, if you forego the battery charger and own a smaller smartphone, there's space for a lipstick, tissues and mints. My pleasure! I'm the same. I lug around my massive Speedy bag because I feel more comfortable carrying my entire home with me at all times......until my shoulder protested from the extreme weight. yup that's about right. i use mine when i'm going out with the girls hehe. Totally agree with you there. By the way, YOU have a fab Chanel collection . Sher, I was *this close* to buying a Maxi. In the end, my badly injured shoulders couldn't take the extra weight. BTW, the caviar WOC is way heavier than the goatskin. oh, no - don't make me want one of these! Suki, I've got my eye on a similar charger. There's so much available for iPhones but not a lot for Android phones :( It'll save me from having to lug around an additional charger. I got mine 1 year and a half ago so I think all their models are updated now and maybe have even more charge power. The only bad thing is that the one I have is quite bulky, but the ones for Samsung look a lot slimmer. Though I think the bulkiness is definitely worth the extra battery on the go!